You might had taken out a credit card at the spur of a moment but now facing problem to manage it. In such a situation, you can close the credit card. You might had taken out a credit card at the spur of a moment but now facing problem to manage it. In such a situation, you can close the credit card. However, there are certain steps you need to follow in order to close a credit card. Go through this article to know how to close a credit card in the right way. First of all, you need to choose the right credit card. To do so, sit with a pen and paper and list the interest rates, rewards, annual fee, etc. necessary details of all your cards. Also, keep a column to mention the date you took out the card. Then go through the list and find out which card is difficult for you to maintain and choose one card which you no longer want to use. It is advisable to not close your old cards; instead it is better to close an account which you have opened recently. This will help you avoid lowering your credit score. Another thing you need to do is use if there's any reward in your chosen card before you start the procedure to close it. After you choose the required card, it is time to communicate the information with your credit card issuer. Each bank might have its own procedure; so it is always better to call the customer care or visit the bank in order to know the necessary details. You also need to know the terms and conditions on the card. For example, a bank might charge a penalty to close an account before a certain time period whereas, another bank may revert back any reward if you close an account before six months or one year. You need to repay any outstanding balance before you close a credit card. If you are not sure about the pending balance on your card, you can always call the customer care to know whether or not there's any outstanding balance, and you can make the payment online. Another thing you need to be careful; if you make the cancellation request after the billing date, there might be some residual balance which is not reflected in the credit card statement and you might not be aware of. However, if there's a huge amount of balance, you might have to make the payments in two or three months' time and then close the account. Alternatively, you can opt for balance transfer by transferring your outstanding balance to a card with lower interest rate, and then opt for closing the card. A verbal communication should always be followed with a written one. A bank will not follow the procedure unless they are informed in writing. When you request for credit card cancellation, the issuer will verify the authenticity of the request and act accordingly. Always remember to keep the documents so that you can produce it in case of any dispute in future. It is true that banks issue credit cards for their own profit. Therefore, when you write to them to cancel your card, you might get a call from the bank asking you to withdraw your cancellation request. They may also give you a lucrative offer so that you continue using the card. However, it's finally your decision and do not pay heed to the requests if you're not able to manage the card or you think the card is not worth to keep. So, to deal with such a situation, listen to their offers, and if you still want to cancel the card, then convey your decision politely, and ask them the necessary process to follow. Always get a document from your bank that the card has been cancelled and outstanding debt has been paid off. The bank will communicate the required information to you in writing stating the necessary details about the card. Once you get the written confirmation, it is better to destroy your card so that you don't try to use it by mistake. After you get the written confirmation from your bank regarding your credit card cancellation, wait for a few weeks and order your credit reports. Go through it and check whether or not there are any errors regarding the card; if any, dispute it immediately and get it corrected. Also check whether or not your credit score has dropped. Your score might drop a bit since cancelling a card reduces your available credit limit and in turn, your debt-to-credit ratio might drop. As a result your credit score might also drop as it is a factor on the basis of which your credit score is calculated. 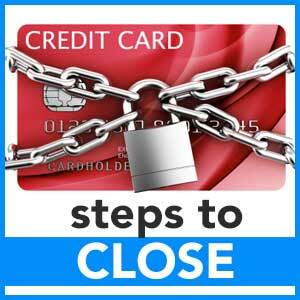 Important consideration: Closing too many credit cards may drop your credit score significantly. This is because your credit limit will drop suddenly and in turn, it might affect your score negatively. As a result, it might reduce your chances to qualify for a loan or credit in near future. Also, it is better to not cancel your oldest credit card due to the reason that it will shorten your credit history, which also may impact your credit score negatively. You should also try to avoid closing a card with a high credit limit as it may also reduce your current credit score to some extent. Once you complete the process of cancelling your credit card, take care to manage your other cards wisely. If you have closed a card with high interest rate, then it might help you manage your other cards effectively. However, it is always better to plan a budget and follow it in order to save a certain amount every month. Also, if your credit score drops a bit, then manage your credit well and it will bounce back to the original or be better within a few months. If required, consult a financial adviser for suggestions on how to manage your finances better. The bottom line is that it is your financial situation, so you need to manage it efficiently.